In Video Marketing, distribution is part hands-on technical stuff and part strategy. The technical part deals with the mechanics of getting the finished video out into the world, which is video hosting. It also deals with SEO (search engine optimization) and with analytics. [Read the pervious blog post: Hosting Video for Small Business – What I Learned the Hard Way for in-depth knowledge on the technical aspects of distribution]. 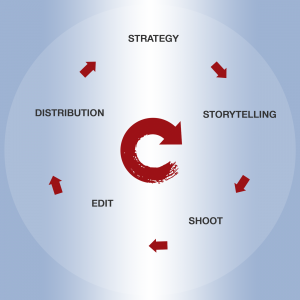 As you can see below, video marketing is a circular affair: Strategy starts with being clear on distribution channels. The first question when you start with video marketing, is: “For which [social] media channel am I producing my videos?” – or at least it should be the first question, once you get over the fact that “Which camera shall I shoot with” is NOT the first question to ask. The challenge is that the social media distribution channels change constantly. The blogs I wrote on this topic (less than 6 months ago) are big-picture still relevant, but the details, such as video length and format, are already helplessly outdated (see links below). For instance, for SEO the former all-important key words no longer hold the weight they did only a few months ago and Twitter now allows for videos 140 seconds long, where before they capped it at 60 seconds. This means, you will find yourself – most likely – re-doing, finessing, re-shooting, and re-editing the same content repeatedly. Reacting not only to channel changes, but also to overall trends, and consumer behavior. And you, as a small business owner, will need to pivot much more often with your content and offerings as well. You might find in your analytics that your viewers jump ship at a certain spot in one of your videos and moving things around, or supplementing your video’s content with text, or a graphic is needed so the viewer doesn’t miss the most essential information. Whatever the data may show you, the one thing that is certain is that video is no longer that one big investment asset that stays the same for a long time. Video today is either built for a very short consumption time frame, or in constant flux. And this is especially true for small business, and even more so, for content produced for social media. So, what has changed since last fall? Well, first it’s all about Facebook and secondly, it’s all about mobile. This means that small businesses (and big ones too) look for their clients on Facebook over Google ad words and over any other social media platform. And, video is the highest ranking asset on Facebook. Meaning, if you reach out with Facebook ads to prospects, you better have video. 90% of all FB users sign in on mobile, and 85% of those are watching videos on mute! It’s 2017: Social networking isn’t just for millennials anymore and Facebook is angling for a total mobile experience. One thing remains crystal clear: Video is on everyone’s agenda. As major social platforms evolve to better accommodate audience demand for video, it’s even more necessary for video content to be built to succeed on each platform. This Wistia strategy guide with start you off right. Video content on social media is not just about metrics, it’s also an essential part of your customer journey. Focus on posting on the social media that is best suited to your target audience.